Just when you thought it was all nature, a massive Black 2x2x10 girder stares you in the face. 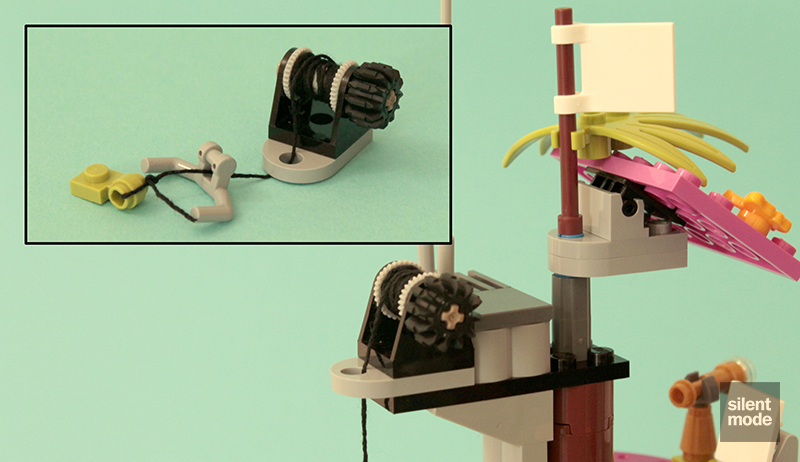 It appears in 16 other sets, and is long overdue for an appearance in PAB walls – make it happen, LEGO! The White clip-on sign (bottom) is actually very uncommon, making an appearance in only three other sets including Heartlake Vet; just something to be aware of. The Dark Pink 4×6 studded tile also appears in Jungle Falls Rescue, and surprisingly also in 79104 The Shellraiser Street Chase from TMNT: this is another resurrected part, going all the way back to 2002. 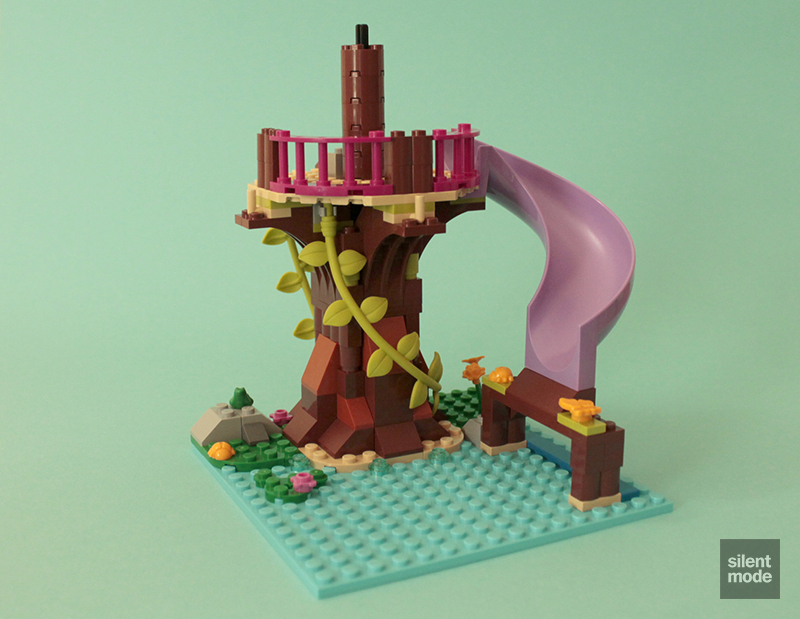 You’d think the Magenta curved fences are exclusive to this set, but they also appear in 41052 Ariel’s Magical Kiss from the Disney Princesses theme, in the same quantity. That was a set I’d planned on reviewing, but eventually decided against. Also of note is the Tan 10×10 octagonal plate, which makes its sixth appearance in a set. If you like building tree houses, it’s worth holding on to these. Our final featured animal is this chimp, which is currently exclusive to this set. It’s the exact same mould as the “orangutan” in Orangutan’s Banana Tree and the monkey in Jungle First Aid Bike, except this time it’s in Black. For some reason BrickLink calls this animal an “orangutan”, which is why I’m using my own eyes. So as we get right back into building the tree, we eventually discover that the minidolls have tried to recreate Yggdrasil (look it up). The 2x2x10 girder fills the cavity left by the Reddish Brown and Dark Orange parts, in order to strengthen the tree. The two Lime vines from the unnumbered bag fall into place, in one case wrapping around the tree. Fortunately the connections aren’t as fiddly as they could be. Installation of the Medium Lavender slide part is complete! And the elven safety people will be happy with the Magenta railings in place, too. You’ll notice the stack of Reddish Brown 2×2 round bricks, with the 12 length Technic axle inserted. The axle was quite hard to insert through all those holes, but you’ll be relieved to know you can’t push it too far down. That stack is actually part of a communications tower, where the signals from all those “golden” walkie talkies bounce from. We also have a golden telescope and a map, in case anyone gets lost. Right on top of the tower goes this flag, which is also meant to have stickers on it. 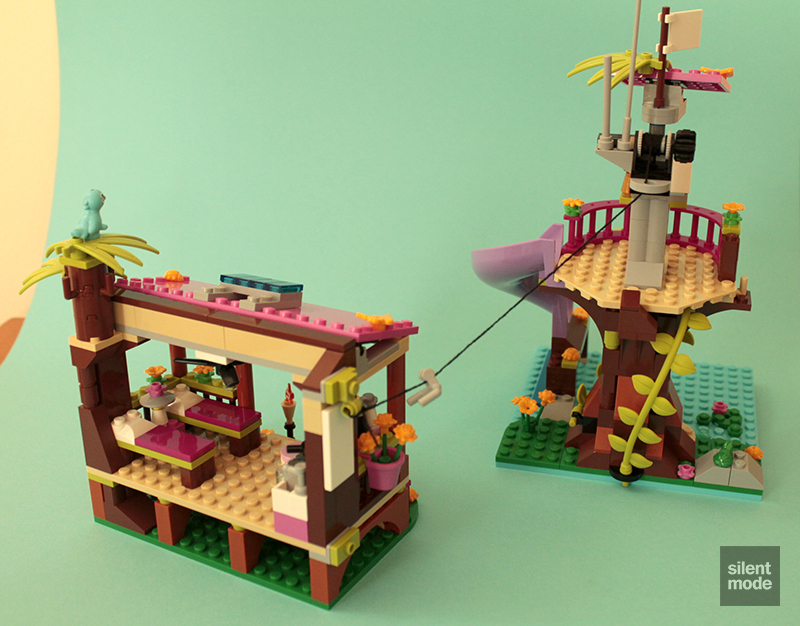 Taking no inspiration whatsoever from The Ultimate Tree House, the Rescue Base has a zip line! What is different is that it make use of this winch and a Friends handlebar. Again, as demonstrated in Jungle Bridge Rescue, it’s not necessary to tie a knot in the winch, as a Technic axle pin takes care of the string; you will, however, have to tie a knot around the Lime 1×1 plate with ring. That plate attaches to the other building by way of one of those 1×2 jumper plates we added to the side. From there, you can adjust the tightness and length of the zip line by moving the tree and building closer or further apart, and winding the winch in either direction. The choice is yours! This time we get a spare Lime swordleaf part, and also a Medium Stone Grey antenna. 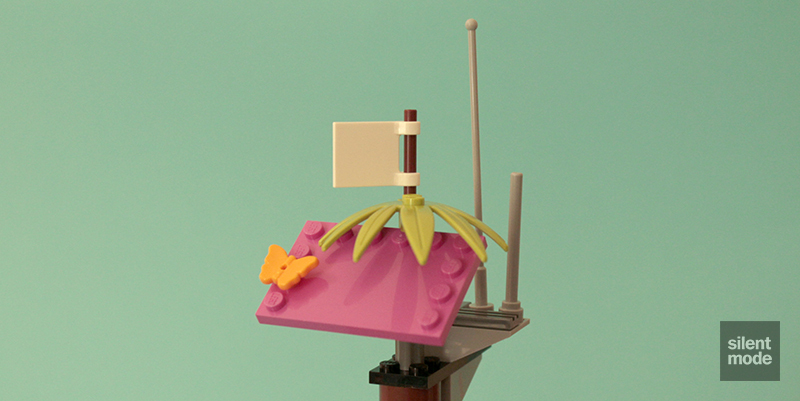 It was rather flimsy when placing it on the communications tower, so it will come in useful if you lose it one day.